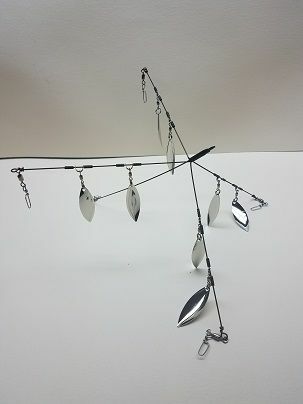 5 Arm RIG with Premium 0.040 Stainless Steel wire and 8 Blades. 1 arm is approximately 7.25 inches long and the other 4 are approximately 6.25 inches. Comes equipped with a 75 pound test crane swivel from Rosco® and a coastlock clip. There are 2 Nickel Brass Blades size 3.5 (1.56") attached to each of the 4 shorter arms for a total of 8 Blades. We have sold over 25,000 rigs on eBay, our website and Direct. We also CUSTOMbuild to customers specifications. We have 0.035, 0.040, 0.045, 0.051 and 0.0625 wire available.